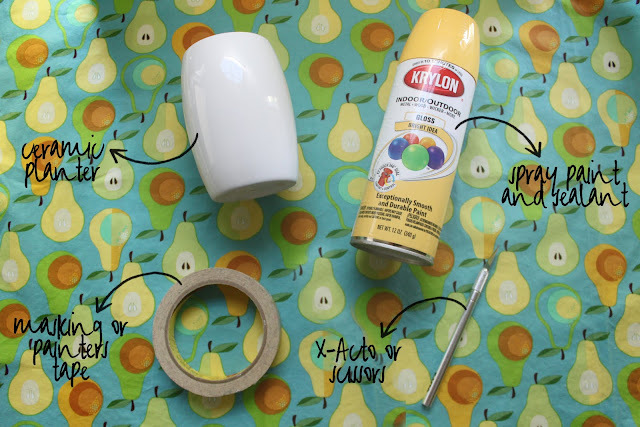 We shared this simple plant makeover a few weeks ago on The Lovely Cupboard. Grab some spray paint and a plain planter, and jazz up your decor with this tutorial! If you read our blog, you know that my sister-in-law, Shannon, and I LOVE estate saling. In fact, Shannon even wrote a 3-part series on how to prepare for and find the best stuff at estate sales. If you know what to look for, you can furnish your home or add to your collection pretty inexpensively. And don't turn something down just because it needs a little work - that's the fun part! These little checkered planters are an example of a cheap estate sale find (I think I paid $1.50 for 3) that are transformed into something pretty and useful with a little paint. SUPPLIES: ceramic planters, spray paint and sealant, masking tape or painters tape, X-Acto knife or scissors, measuring tape. ONE: first, measure your planter to determine how long to make your checks. Mine was about 12 inches around and 5 inches high, so I decided to make 6 rows of checks 2 inches long. 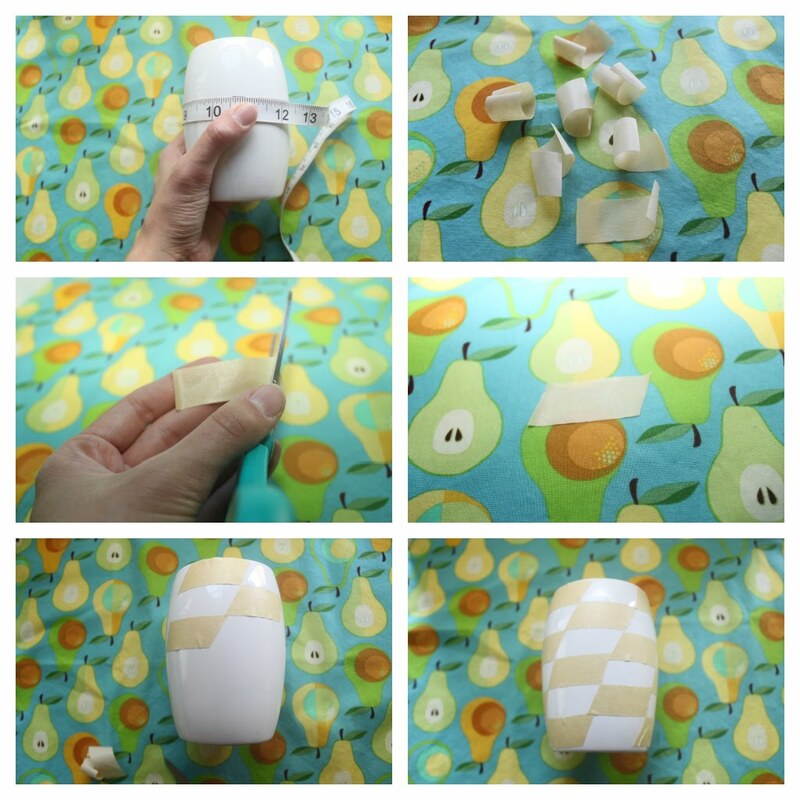 TWO: next, cut out a bunch of rectangles from your masking tape or painters tape. THREE: using your scissors, cut the ends of each rectangle at an angle. FOUR: here's what your checks should look like. 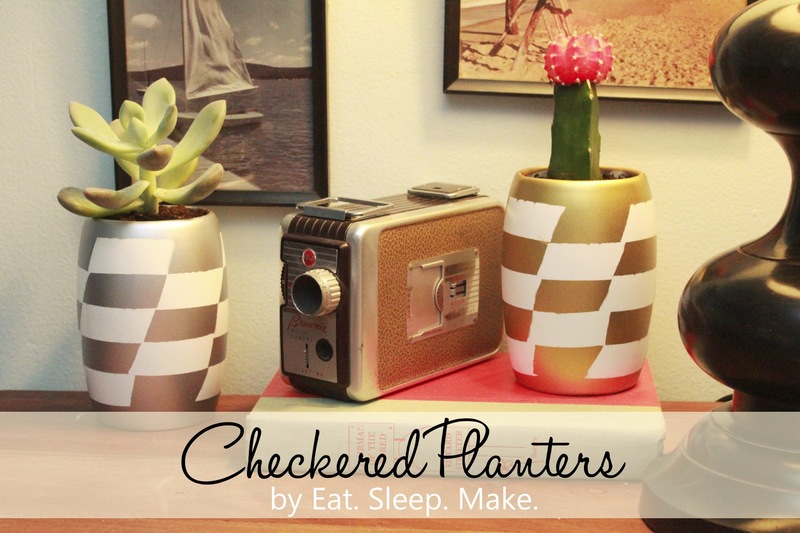 FIVE: carefully stick your checks around your planter. Now fill with your favorite plant and display proudly! I'm a big fan of succulents (plus they don't die easily), so I picked up a few at a local convenience store and put them in the planters with some potting soil. If you're having trouble finding succulents in your area, you can usually find a lot of fun varieties at Home Depot. I've even seen some basic succulents at grocery stores. I hope you enjoyed my project, and if you'd like to see more great DIY's, recipes, and home decor, please come visit Shannon and I on Eat. Sleep. Make! You can also find us on Facebook, Pinterest, Twitter and Bloglovin. Simple but really cute! What a fun retro look. I love everything. The whole shelf is way too cool.